We are a non-partisan group and call on all political parties to prioritise this issue. Some of the most deprived areas of the United Kingdom are in the West Midlands. 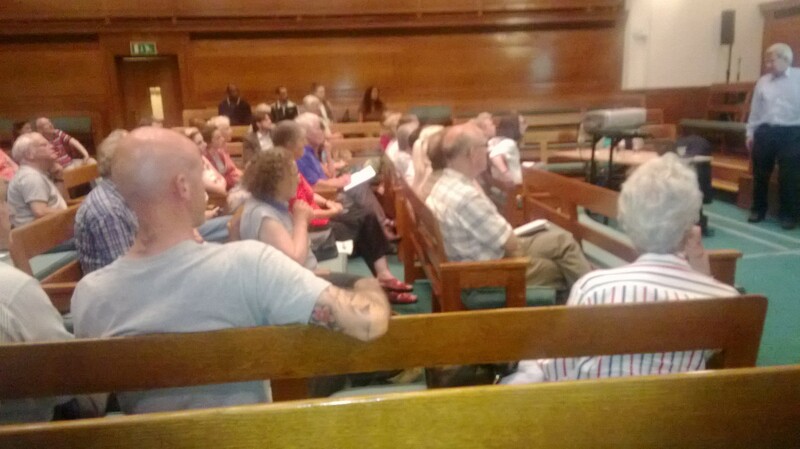 The Group holds regular meeting to help share awareness of the impact of income inequality and the social harms which it generates, both on a national and local level. Six years ago, the publication of ‘The Spirit Level’ kick-started a debate about income inequality and its dire consequences across all areas and strata of Western societies, especially those of the United Kingdom and the United States. As I write, I’m reflecting on David Cameron’s speech to the Conservative Party Conference, in which the Prime Minister talked about improving social mobility and tackling inequality and poverty. Whether or not Cameron is being as genuine in his ambition as Lord Ashcroft is about that pig story remains to be seen, but it shows that inequality has become a significant part of British political discourse. It was only a matter of time before the sometimes dry academic writing on the topic was transformed into something far more visual. In 2012, Katherine Round was approached to make a film based on ‘The Spirit Level’ and, after receiving huge public support via a crowd-funder, revealed previews at last year’s Inequality Today event. 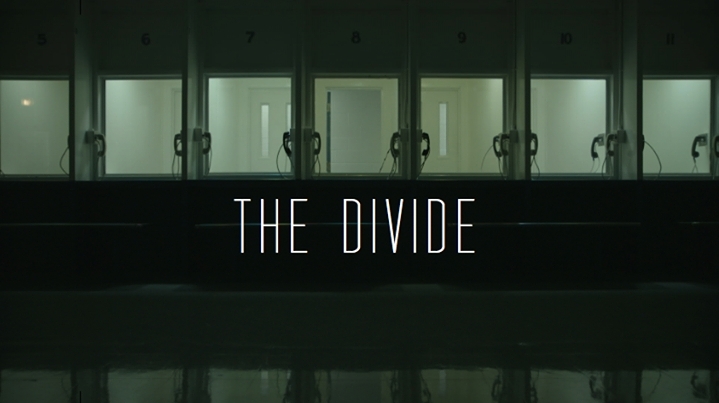 The documentary- now called ‘The Divide’- has since then been premiered and played by local groups. Luckily for Birmingham, the Co-Operative Film Society- Just Film- were given the opportunity to show it in the Second City, the second most unequal city in the UK. All the ordinary people interviewed are empathetic: some stories, though, were more affecting than others. Take Keith, the American prisoner who fell afoul of Bill Clinton’s ‘Three Strikes’ rule- he is serving a 25 year sentence for being in possession of one gram of an illegal substance. Because of his crime, he is searched from top to bottom- literally- every day. The whole experience has made him hate humanity: even behind a glass screen, his seething rage is terrifying. Another important figure in the documentary is Leah Johnson: she is a black lady from Richmond, Virginia who seems to be always laughing, who sees the humour in her struggles to properly serve people at KFC. Underneath the laughter, though, is a sad story involving a serious health condition, fears for her community and her son’s friends, and ultimately, her struggles to get on. In Newcastle-upon-Tyne, Rochelle is a care worker on a zero-hours contract- she has to visit elderly and disabled people in their homes, and look after their needs for 30 minutes; the work is unpredictable and poorly paid; her family’s life is severely impacted as she’s unable to spend time with her two children. We also see how a couple at the richer end of the income scale in the USA cope with life in a gated community: trite observations of such communities being situated by a golf course give way to the sad revelation that as their old friends fell out with them, their new neighbours’ children feared their peers and refused to play with them! In between the portraits, talking heads such as Richard Wilkinson, Michael Marmot, Paul Piff and Noam Chomsky discuss the developments of the last thirty-five years. There is also insightful commentary on the rise of gated communities, the mentality of the 1% and even Max Hastings pops up to condemn his friends who believe they deserve their obscene salaries. Sir Alan Budd, an economic advisor to Margaret Thatcher, expresses his regret that his free market ideals have got so far out of control. The only commentator to come out of the documentary with their reputation taking a hit is the venture capitalist Richard Berman who at 70 has three children under 13 and is building up an African art collection: he seems to feel his boundless energy and drive entitles him to collect ever more money- but surely everyone with that enthusiasm for life should be successful? The documentary demonstrates that’s not the case. Tony Blair helps to explain why in an old clip when he laughingly dismisses imposing a maximum wage. The documentary focuses on one particular area of contemporary public concern: housing. Although the theme concentrates on the US experience, it’s particularly relevant as couples plan ahead for the future- Alden wants a second home in Florida; a real estate agent tries to sell a $450,000 home in a gated community by showcasing the sliding drawer in the kitchen. However, we see the dark side: whereas George W. Bush rushed to bail out the banks, home owners who defaulted on their mortgage were told it was their own fault and they wouldn’t be getting any help. As people have to move out of their homes, the bankers are under the impression that they’re in the clear once again. Whilst not a film critic by any means, I found the interviews really absorbing, and sometimes the monotony of life is depicted really well. I also really liked the blues soundtrack that dominated throughout. All-in-all, it really makes you think, and link the dots: however, the film could be far more explicit in helping you to do this- and, more crucially, inspiring you to take action to tackle the problem. As the documentary is barely 80 minutes, there surely was a lot more that could have gone into it: perhaps it was a quality over quantity decision, but there nevertheless does seem to be some filler in even such a short film. This was Just Film’s biggest ever event, and I’d certainly say that the audience were absolutely, entirely aware and in tune with the messages of ‘The Spirit Level’. Whether a newer audience would receive ‘The Divide’ as well as those inside the Birmingham and Midlands Institute, however, is a big question which won’t be properly answered until the film receives a proper release next year: this in itself is a real shame as the documentary was originally supposed to be released before the general election. Nevertheless, this film is another asset to be deployed in the struggle to ensure that income inequality remains on the political agenda for the next five years. Attendees of The Equality Trust’s fourth annual Local Groups Day met with mixed feelings: on the one hand, economic inequality was a subject covered by most political parties in their general election manifesto; on the other hand, the Emergency Budget saw George Osborne “steal” the Living Wage, dressing up one of inequality campaigner’s most revered ideas in Conservative clothes. Perhaps the likes of Citizens UK should be flattered that the Chancellor has paid attention, but it does leave a dilemma of where to go next. The day was opened by Sean Blaine, the Chair of the TET board, who talked about the main changes in the organisation of The Equality Trust over the past year: the big thing is that TET is now an official charity! Sean handed over to Executive Director Duncan Exley who talked about the huge amount of work done by TET- and the surprising partners. Yes, Duncan has had meetings with, amongst other organisations, KPMG and investment funds- some would have thought these would be the last bodies to be concerned about economic inequality. 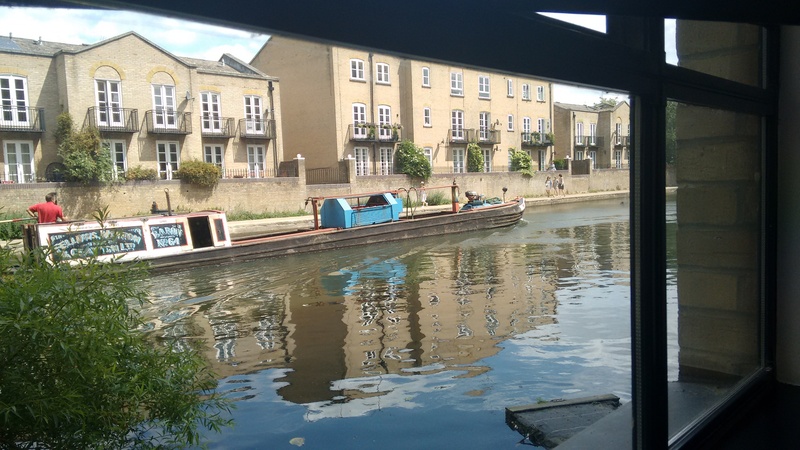 Local Groups Day 2015 was held at the NCVO building in London, and our room had a rather lovely backdrop; also, on occasion, we could hear some very loud swans, the canal’s main clientele. To that end, Duncan unveiled TET’s strategy for the next 5 years: it involves working with the grain of government policies, whilst trying to influence decision-making and policies at all levels of national, regional and local government, as well as those of employers and investors. The ‘Make My Council Fair’ campaign, to be discussed shortly, is a big part of the strategy. 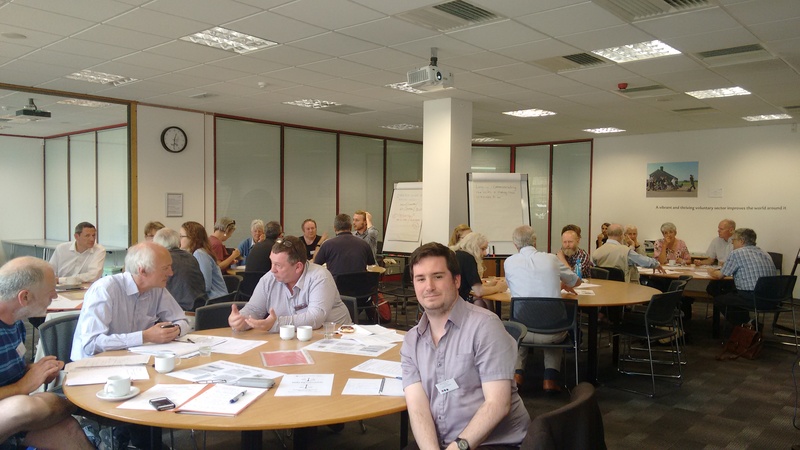 After Duncan’s presentation, attendees, who had been organised into groups, were invited to discuss the strategy and how it could be put into practise. A common theme around my table was that talking about economic inequality should be linked more strongly with real public concerns about, say, the decline of living standards. It was also felt that activists should try to reclaim words and phrases, and redefine them: “aspiration”, for example, has acquired a very specific definition thanks to right-wing commentators, but, surely, it’s obvious that inequality actually blocks aspiration on so many levels- we must point this out at any and every opportunity. Lunchtime provided an opportunity for myself and Shaz to speak with fellow activists from across the country. We were also treated during the lunch hour to an exclusive trailer for ‘The Divide’. This trailer was so absorbing, briefly telling the varied stories of people across the Western world, that I was stunned when the video went black! The afternoon agenda was all about the ‘Make My Council Fair’ campaign. Bill Kerry hopes that local groups will challenge their local councils on a number of issues such as whether they, and the firms they use as subcontractors, pay a Living Wage; pay ratios; whether councils spend on indirect measures that reduce inequality such as imposing a 20 mph speed limit… Bill then dispatched the activists into new groups to discuss how to build a campaign. The second table, on which both myself and Shaz found ourselves, spent a long time discussing the best ways of building alliances with similar-minded groups. Allen from Equality North West described how the group had come to be regarded as the go-to for research and analysis by a whole chain of groups operating in Manchester: yes, the process of developing contacts and relationships seemed as ruthless as Simon Cowell on the X-Factor, but it’s worth it when a whole series of hustings can be run across an entire city in a harmonious and effective manner. A third table concentrated on appealing to decision-makers- this doesn’t just include your council, you could also approach local businesses. Additionally, we discussed the need to avoid making assumptions: you may find common ground with people you never expected to! Other groups emphasised the need to operate through a variety of mediums, and for any campaign to be as relevant to the local area as possible. Everyone came away tired but motivated to go away and put our discussions in practice. This was my third time attending TET’s Local Groups Day and was easily the best thus far. I’d like to thank: Bill and the rest of the team for putting on a great event; everyone I met for being awesome and, last but not least, Shaz for joining me in flying the EWM flag! After the event had concluded, we all went to a nearby pub and continued the discussions. 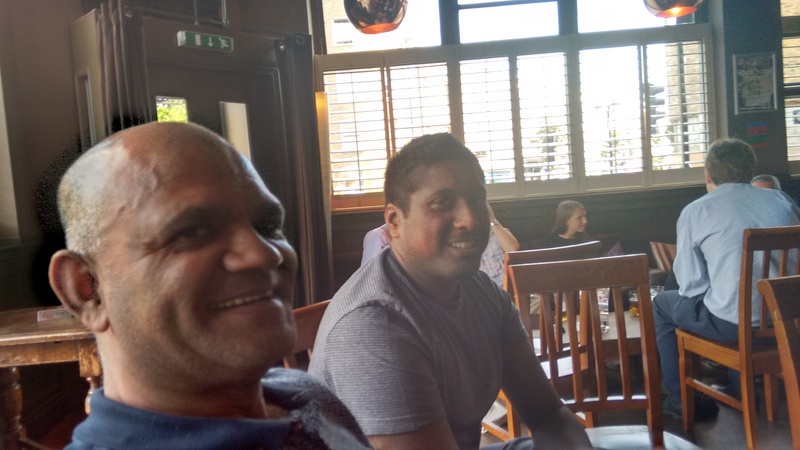 Salim Yakub (l) recently set up a group in Reading- Shaz and myself hope we gave him some useful pointers! Fresh from our successful panel debate from the same week Tom and I visited London to attend the Inequality Today 2014 conference hosted by the Equality Trust. We enjoyed the environmentally friendly train to London. Before the conference began we enjoyed tea and spoke to a few of the other attendees. The conference began with a speech from Sean Blaine about the year that the Equality Trust has had and what the future holds for the Equality Trust and the battle surrounding income inequality. He pointed to the Scottish Referendum, which could be considered as the first widespread UK election where inequality was a central issue. He also said that the Equality Trust would be fighting to make inequality a central issue during the 2015 General Election. Next up for the conference was a preview of the Spirit Level Documentary, which is currently being made. Katherine Round the director talked us through how filming is going and the challenges she is facing. We were then lucky enough to watch a few interview clips that may make the final edit. People from the bottom, the middle and the top of the economic scale were interviewed as well as prominent academics. What was apparent from the clips was that everybody suffered from extreme economic inequality because status competition meant that nobody was happy. At all levels of society people felt insecure about how much they had compared to their peers. Even the very richest felt inferior to others who were also the very richest. On top of this some of the experts arguing against extreme income inequality were surprising including former economic advisor to Margaret Thatcher, Alan Budd. Once we had finished watching the clips, Katherine Round was joined by Richard Wilkinson and Katie Pickett for a question and answer session. We were very excited to learn that the Spirit Level Film will be released next year. I was one of the people who helped fundraise the project and so I am delighted that the film will become a reality. We also were told that there could be an opportunity to host public screenings up and down the UK. Equality West Midlands would be overjoyed to host a public screening in the West Midlands. After tea and more mingling, including a brief chat with co- author of the Spirit Level Kate Pickett, we had an economics lecture with Adair Turner. 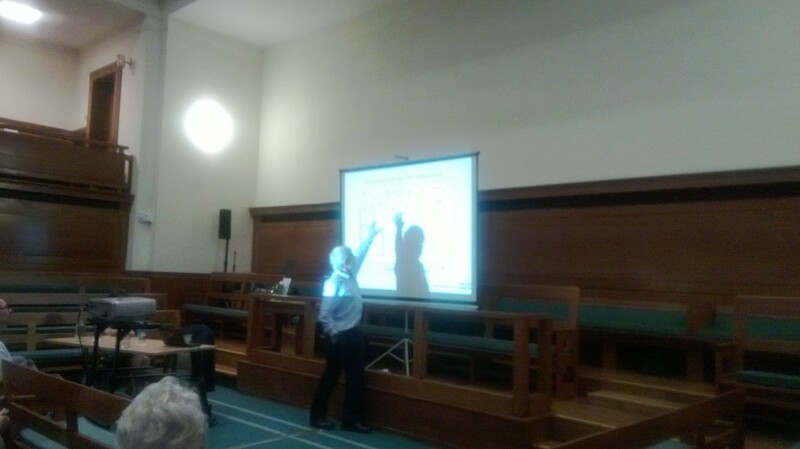 Through various graphs (we do love our graphs) Turner explained how the current economic system is self-defeating, with inequality being a key factor in creating an incoherent and self-damaging economy. Turner does not believe in exact income equality but he says the evidence demonstrates that the levels of extreme income inequality as found in the UK and the US create an unstable economy where only a few can prosper. To finish the event Wilkinson and Pickett joined Turner for another question and answer session. Buoyed by enthusiasm from the conference Tom and I went to a local pub to discuss potential ideas for our future campaigning activities. We were given quite a few from the event, which will hopefully become more concrete ideas over the next few weeks and months. Equality West Midlands learnt a lot from Inequality today 2014 and hope to use what we learnt to help in the battle against extreme inequality going into the General Election of 2015 and beyond. At the recent Conservative Party conference, Prime Minister David Cameron claimed that income inequality has decreased under the Coalition government, but a lot of evidence suggests that most people aren’t feeling the benefits of a supposed economic recovery: on Sunday, national media reported on the Resolution Foundation’s study which showed that 5.2 million people are now in low-pay jobs- a significant increase in numbers from the year before. Clearly, as our panellists emphasised throughout the evening, the present state of affairs harms Britain, both economically and socially, and will continue to do so unless politicians are brave enough to enact the major changes needed to tackle the problem. Our first speaker was Stewart Lansley, the author of ‘The Cost of Inequality’, a study which convincingly demonstrates that income inequality in the UK is detrimental to its economic performance. He described how, despite the publicly issued concerns of the World Economic Forum, US President Barack Obama and The Pope, inequality has grown since the crisis of 2008/9- in 2013/4, the top 1% in the UK took 46% of total income whilst the bottom 50% lagged well behind on only 28%. Lansley identified several causes for this situation: politicians continue to deny there’s a major problem with income inequality; despite the OECD and the IMF recognising the problem, they encourage national government to pursue policies which only exacerbate the issue of inequality; there are major splits over the causes of inequality and best ways in which to tackle it. The big sticking point, however, is whether there is an existing workable alternative to the existing system- this point would be discussed later on, but Stewart warned that if nothing changes and inequality is not addressed then the British economy will continue to stagnate, and be at even further risk from future crises. Our next speaker Joy Warmington, the CEO of Birmingham-based equalities consultancy brap discussed what inequality does at a human level: fundamentally, it sets different groups in society apart. Most of the policies enacted by the government will never affect those politicians who devised them in the first place- instead, the policies pose an ever greater challenge to already poor people, and serve to further disenfranchise them. The political and media climate has helped to harden attitudes towards poorer people- increasingly, they’re not seen as part of society. Joy cited a poll in which 60% of the respondents agreed with the statement that people could get a job if they wanted, despite much evidence that this isn’t the case. This poll reveals another side to this hardening: the shifting of blame onto others- increasingly, it’s seen as someone’s own fault if they don’t make it when in fact systemic disadvantages can seriously undermine a person’s chances of succeeding in life right from the very start. The shifting of blame also has a very ugly undertone: in 2013, 31% of people said that they had experienced some form of racial prejudice. In seeking to find a solution to the problem, Joy noted that many companies say all the right things on providing equality of opportunity for everyone, but ultimately fail to act upon it- if any changes are to be occur, people in power (not just politicians) need to practise what they preach and do things differently. Joy observed that legislative drivers aren’t enough, though- there has to be a moral imperative to take action; she proposed asking the simple question: how much worse does Britain want things to get before change occurs? The third panellist, Karen Rowlingson, a Professor in Social Policy from the University of Birmingham, spoke on wealth inequality. A Policy Commission set up by the University assessed various ways in which to deal with total inequality and the likely outcomes of the pursuit of differing policies. Part of the Commission’s work revealed that there are three broad economic groupings in British society: firstly, there are those with little to no wealth- 20% of the British population have more debts than savings; the middle group is affected by house price inflation fuelled by George Osborne’s Help to Buy scheme and the decline of defined pensions; the third group is the very richest in British society- current policies allow them to avoid taxation of much of their wealth. Karen identified several policies such as Labour’s recently announced Mansion tax and proper funding of the Social Fund which could help to tackle the problem: however, public attitudes, such as a perhaps surprising belief amongst poorer people about the unfairness of inheritance tax, and a general lack of understanding about wealth and taxation issues makes it hard to sell progressive policies. After the three speakers had given their presentations, the audience were invited to submit questions: the topics discussed in this part of the evening ranged from the role of trade unions to the strong influence of political will; from globalisation to localism; from UKIP to using GDP as a measure of growth; from the need to reform the taxation system to the thorny question of whether if challenged, CEOs would carry out their threats and actually leave the UK. This lively debate concluded on a positive note- change is possible, but it requires political and public will to make it happen. ‘How to Build a Society That Works for Everyone’: Tomorrow at 6.30pm! We are 24 hours away from Equality West Midlands’ biggest event of 2014. ‘How to Build a Society That Works for Everyone’ is taking place in the Main Meeting Room of the Priory Rooms on Bull Street in Central Birmingham TOMORROW EVENING. The debate is open to everyone free of charge (but we would appreciate any donation you can make towards the cost of the evening). ‘How to Build a Society That Works for Everyone’ will be chaired by Karen Leach and will involve Stewart Lansley, Joy Warmington and Karen Rowlingson. Karen is the Coordinator of thinktank and consultancy Localise West Midlands, which promotes local supply chains and ownership of the economy for social justice and sustainability. She began her activism within the Friends of the Earth network, where the evident connections between inequality, consumerism and environmental limits always resonated with her. The economist and journalist Stewart Lansley is the author of The Cost of Inequality and (with Joanna Mack) of Breadline Britain, The Rise of Mass Poverty, to be published in February by Oneworld. Joy Warmington is CEO of brap, a human rights charity. As a nationally renowned equalities practitioner, Joy’s expertise has been sought by organisations including the Department of Health, the Department for Communities and Local Government, the Department for Education, Birmingham City Council, and many others. Joy has written and co-authored over 20 books, articles, and reports on subjects as diverse as implementing organisational change, improving public sector engagement practice, and using human rights to improve service delivery. Joy is regularly asked to comment on equalities issues in the media, most recently appearing in the Economist, Daily Telegraph, and Health Service Journal in addition to numerous appearances on BBC radio and television. Karen Rowlingson is a Professor of Social Policy in the Institute of Applied Social Studies at the University of Birmingham, as well as being Director of the Centre on Household Assets and Savings Management (CHASM). Along with Stephen McKay, she is an author of Wealth and the Wealthy and has co-authored numerous articles for academic publications on topics connected to income inequality. In November 2012, Karen spoke to Equality West Midlands on the topic of pre-distribution vs. re-distribution. I know today’s weather has been shockingly poor, but I hope that doesn’t deter you from coming out tomorrow. I hope to see you at the debate! I am delighted to announce that Equality West Midlands will be holding a public debate on the 22nd October at the Priory Rooms, Bull Street, Birmingham, starting at 6.30 pm. These prominent academics and local campaigners will be joining us to discuss the impact of growing income inequality in the UK, and how we, as a society, a group and individuals can turn the tide. The debate will be chaired by Karen Leach and will involve Stewart Lansley, Joy Warmington and Karen Rowlingson. Karen is the Coordinator of thinktank and consultancy Localise West Midlands, which promotes local supply chains and ownership of the economy for social justice and sustainability. This has included setting organisational strategy and systems, leading a research project on maximising socio-economic benefits through localised economic development; initiating a national Alliance for a Better Economy; coordinating policy responses and generally keeping all the plates spinning. She is also involved locally and nationally in Friends of the Earth, where she developed her interests in sustainability, economics, planning and policy. The economist and journalist Stewart Lansley is the author of The Cost of Inequality and ( with Joanna Mack ) of Breadline Britain, The Rise of Mass Poverty, to be published in February by Oneworld. We hope that many other prominent activists and decision-makers will also attend to provoke a lively and engaging debate on the consequences of income inequality. The debate is open to all, free of charge. We will, though, appreciate any donation you could make to the cost of the evening. Please follow us on Twitter and check out our Facebook group and blog for more information about the debate as we draw closer to the day. On May 8th, the Sutton Coldfield International Development Group hosted a screening of a shocking documentary about the United Kingdom being, effectively, the world’s biggest tax haven. ‘The UK Gold’ demonstrates in stunning detail how transnational corporations and highly wealthy individuals avoid paying tax which they rightfully owe by registering their companies on remote islands- all with the acquiescence of the United Kingdom. In the 1950s, two European cities were embroiled in combat over which of the following would become the world’s financial capital: Paris or London. The latter won primarily because of the links forged around the world by the reach of the British Empire, and these links are still very much alive: the Queen is sovereign over 14 territories, including Bermuda and the Cayman Islands- two of the biggest tax havens in the world. Several experts interviewed for the film, including Private Eye’s Richard Brooks, the founder of the Tax Justice Network, Richard Murphy and ‘Treasure Islands’ author Nicholas Shaxson, confirm that billions upon billions of pounds are transferred through the City of London to these tax havens. Barack Obama has publicly ridiculed the notion that a single building in Bermuda can contain 9,000 companies and has put forward laws which would ensure that every company operating in the United States of America has to reveal its true owners, but British leaders have only paid lip service to tackling the issue- the reason? The great influence exerted by the City of London. As a city within the capital city (yes, I know), the City of London has its own Lord Mayor, elects its own Common Council, and even has its own police force. Most crucially, however, the City of London has a unique presence in the Houses of Parliament- the City Corporation, a body which is backed by firms operating in the Square Mile to promote their interest, have their own office in Parliament known as the ‘Remembrancer’ and a seat beside the chair on which the Speaker of the House of Commons sits. On top of this, several Members of Parliament (both in the Commons and Lords, on all sides of the political spectrum) have either worked for, or have the financial backing of City-based firms. This influence results in episodes such as the committee set up to reform corporate tax only comprising lawyers working on behalf of companies operating within the City of London… even worse, such episodes have never been reported by our national media. The film’s narrator, renowned actor Dominic West, depressingly noted several times of meetings that were never, until ‘The UK Gold’, brought to public attention: one humourous example detailed the visit of the Prime Minister of the Cayman Islands to the United Kingdom. This PM gave a presentation to a minister in the Foreign and Commonwealth Office about how businesses could best maximise their investment opportunities by taking advantage of the Cayman Islands’ tax haven status. However, when he returned to his island, the PM was promptly arrested by the local police force and charged with corruption! Much of the film concentrates on the nebulous relationship between the United Kingdom, the all-powerful City of London and the territories which gratefully receive the businesses looking to squirrel away as much as money as possible, but this isn’t all the story. The film is given a real international dimension through a visit to Zambia- transnational corporations have used this developing country as a tax haven; in one year alone, $16 billion, which could have been used to greatly improve the lives of many Zambian children (e.g. by being spent on developing proper educational facilities, on proper healthcare, on proper sanitation, on proper infrastructure…) was stolen through the unscrupulous practices of big business. The biggest star of this film is not one of the many experts, whose interviews are featured throughout- instead, it is a priest from Hackney, a London borough which borders the City of London. 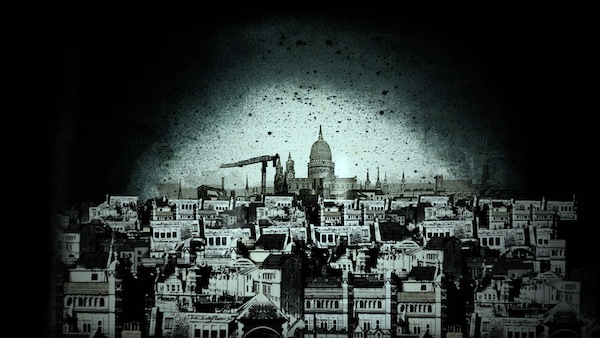 Father William Taylor describes himself as a conservative who believes in the strength of relationship and institutions- but he has grown to believe that the City of London wields a dark, demonic power that is ultimately designed to serve itself, rather than serve wider society. He opens the film with a potent question: can we compare the rioters of 2011 to the financiers in the City of London who helped to create the worst financial crisis in living memory? 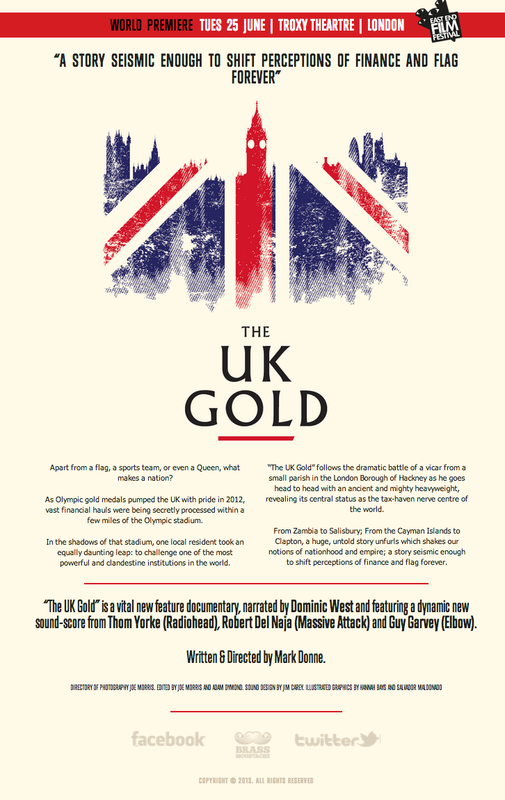 The film ends with no real resolution, but there’s still plenty of positive stuff to take away from it: ‘The UK Gold’ brings together the work of notable campaigners and writers like Nick Shaxson, Richard Brookes and Richard Murphy in an accessible format, replete with good graphic representations and a pulsating soundtrack by Radiohead singer Thom Yorke and Massive Attack member Robert Del Naja (I particularly enjoyed the war-beat music which accompanied William Taylor around the City of London). It also shows up the political establishment in a poor light- if normally loquacious politicians are suddenly so silent on the subject of tax havens, surely they must be trying to hide the murky realities of tax haven operations. Additionally, the public revelations that several huge companies operating in Britain- Vodafone, Topshop, Starbucks, Amazon and Google- have been routinely avoiding tax have caused outrage amongst the British public. Despite the efforts of the City of London and severely conflicted politicians, the morality of what’s going on inside the Square Mile is being seriously questioned by growing numbers of people. ‘The UK Gold’ provides further evidence that the so-called ‘Golden Goose’ of the British economy is soiling its nest, damaging both Britain and the world at large. The whole issue of income inequality, and how it’s depreciative effects on societies where the gap between rich and poor is at its highest, was brought to the fore by the publication in 2009 of the groundbreaking ‘The Spirit Level’. Co-authors Richard Wilkinson and Kate Pickett convincingly demonstrated that high income inequality played a negative role in all areas of life, not just affecting the poor but everybody living in that society. Their book immediately made Wilkinson and Pickett the epidemiological equivalents of rock stars and thrust the issue into the national spotlight. Politicians, including the Prime Minister David Cameron and Labour Party leader Ed Miliband, have talked about the need to reduce inequality in the UK, whilst the authors set up The Equality Trust (TET) to promote the findings found in ‘The Spirit Level’ and urge policy-makers to act fast to avoid the further corrosion of society. For two years, Equality West Midlands has run as a campaigning group affiliated to TET, but this was undoubtedly the most high profile event in the group’s history- after all, it’s not every day that a co-author of the book that inspired the group comes to speak to them! 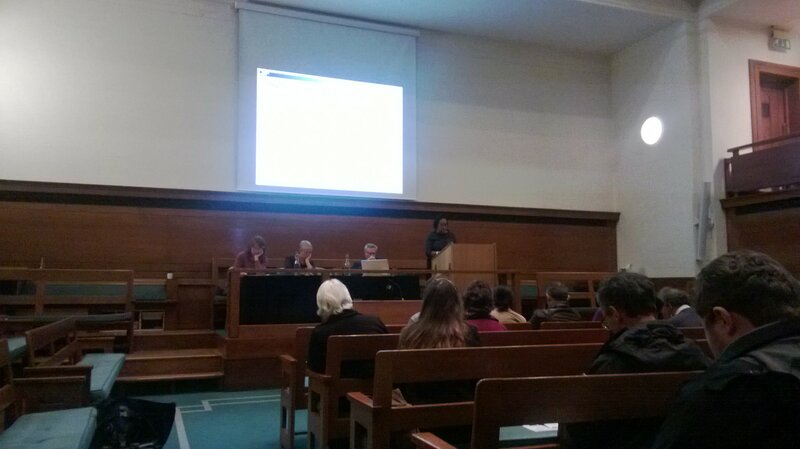 The evening was held at the Quaker Meeting House in Birmingham city centre, and was attended by at least 85 people. Whilst some of the attendees were excited members of Equality West Midlands, it was great to see that others came from the Quaker Peace Committee, the Green Party, and other interested organisations. Earlier in the day, I’d heard Richard Wilkinson speak to a captivated audience at the Active Inclusion Summit, hosted as part of Birmingham’s Social Inclusion Process. After a 45 minute talk about the principles of ‘The Spirit Level’, there were still cries for more- almost as if they were calling back The Rolling Stones for an encore. It’s fair to say I was looking forward to this talk. Professor Wilkinson opened the lecture by showing us a picture taken outside King Cross station of a group of commuters. NOBODY in this picture looks at all happy; they’re either looking unhappy, stressed or have their mobile phone glued to their eat- all of them stand as lone individuals. Although life in the 21st century is much better than just two centuries ago, it’s not a Utopian paradise. Despite the central heating systems and televisions in most homes and the ability to travel quickly and safely in cars, the high levels of self-harm, drug abuse and violence show that ours is still an unhappy world. The common perception is that the problems mentioned above are more prevalent in poorer areas, but in fact, they occur amongst people in all social strata. If anything, these problems are much more common in unequal societies generally than they are in equal societies. Through a series of graphs which used data from multiple sources, including the World Health Organisation, UNICEF and the OECD, Wilkinson demonstrated again and again that countries with higher levels of income inequality have much greater social problems than countries which have lower levels. ‘The Spirit Level’ attributes this discrepancy to the levels of income inequality in a society- the higher the inequality, the worse the disparity. High income inequality also affects other important statistics: the level of trust of other people is far lower in unequal countries; whilst in the more equal Japan only 8% of the population have been diagnosed with mental illnesses, in the greatly unequal United States, a quarter of Americans have mental health issues; there are ten times more prisoners locked up in American jails compared to those in Japan; the number of homicides in the US is ten times more than even in neighbouring Canada. On the subject of social mobility, about which many politicians have pontificated, Wilkinson argues that the relationship between income inequality and social mobility is very important. Often, it seems that if a father is rich, then his son will also grow up to be rich. Professor Wilkinson noted, with dark irony, that if you really wanted to ‘live the American Dream’ your best chances of doing that would be in… Denmark! There are several answers- for example, wealth could be redistributed via the government imposing higher taxes on higher earners and spreading the money down the chain in the form of benefit payments; alternatively, the gap could be lowered by raising the incomes of the lowest paid (e.g. through the introduction of a Living Wage). Wilkinson proposes also looking at how national characteristics can be shaped in the battle to create a more equal society, for the issue of income inequality doesn’t just affect the poor- it affects everyone. The differences between even those deemed as middle-class and the richest in society are wide thanks to income inequality. The issue of class becomes ever more important in an unequal society- people begin to feel valued or de-valued, inferior or superior; their health and wellbeing is adversely affected; they indulge in more status competition; they are more wary of being judged; most worryingly, there is more prejudice. The issue is outlined most starkly when comparing the average pay of the leaders of FTSE 100 companies and the average pay of their lowest-paid workers- expressed as a ratio, it’s a shocking 300:1. Professor Wilkinson commented that the obsession with social status and the resulting pressures on society was completely inverse to the benefits brought about when human society is more co-operative. He concluded this section of the talk by reminding us that the word ‘companion’ effectively means ‘someone you share bread with’- it would be best for everyone if we focussed on companionship instead of competition. Members of the audience were then invited to ask Professor Wilkinson questions. Topics included how reforms to the British welfare state will affect inequality, the political reception to ‘The Spirit Level and whether we should talk about ‘fairness’ instead of ‘inequality’ due to potential confusion over different meanings of the word. Wilkinson pointed out that due to ‘lags’, it may be a while before we can really understand how government measures impact on inequality (for better or worse), but noted that new research has shown that even from the age of 2, inequality and its consequences can determine how different children will develop. Professor Wilkinson, however, refuses to get depressed- he sees the opportunity to discuss income inequality and how it affects society as ‘exciting.’ There’s already a film being made about ‘The Spirit Level’, which Wilkinson hopes will have the same effect on the subject as Al Gore’s ‘An Inconvenient Truth’ did for climate change. Wilkinson’s end goal in all his endeavours is to get back to establishing genuine relationships and, in the process, repair damaged societies. The A41 road links London to Liverpool, passing through a number of key areas of the UK, including towns in the West Midlands. In 2012, The Equality Trust [TET] teamed up with renowned photographer Colin McPherson, a Scot based in Liverpool, to organise a project which demonstrated how income inequality produces wildly different circumstances and situations for towns served by the A41. Equality West Midlands was one of four regional affiliates to TET who were eager to become involved. The experience opened the group’s eyes to the levels of inequality within the West Midlands in a way dry statistics could never convey. Fiona’s photography, in particular hit home. Fiona chose to concentrate on documenting the variety of shopping experiences found from town to town. Firstly, she visited the Torchwood shopping centre in Solihull, where shops sell high-quality clothing and furniture in a polished environment. Then Fiona encountered a completely different world in West Bromwich- if a failed shop didn’t have the metal shutters closed down over it, then it was one of a variety of bargain shops. Most shockingly, though, many of Fiona’s photos showed a plague of money shops, pawn brokers and payday loan lenders- it appeared that such organisations were taking advantage of an economic crisis which has had an especially devastating impact on towns such as West Bromwich. Further research showed that in the West Midlands, an all-too-common pattern has developed where shops whose sole business concerns money lending of some description have taken up residence where other industries have retreated. In 2013, a lot of opprobrium has been directed at the likes of Wonga, but Fiona’s pictures served to underline the harsh reality that more *action* needs to be taken to stop the rise of such a harmful and toxic industry. 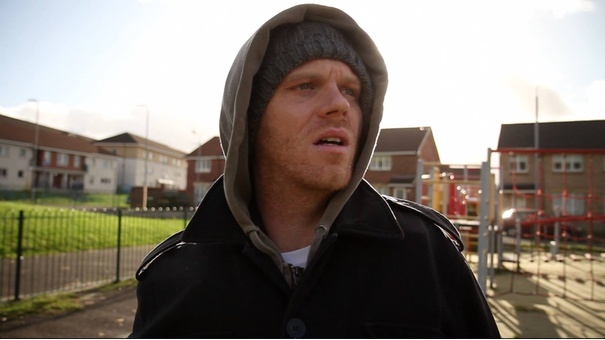 Other members of the group were heavily involved in the project: Tom snapped a poignant image of a tower block behind a locked iron gate, demonstrating that isolation through inequality can apply in multiple ways; Gilly commissioned a poet friend to produce fragile works which showed that inequality can lead to status anxiety, and force people into difficult circumstances. Our photographs and accompanying text and poetry were edited into a special section of a newspaper produced specially for the exhibition of the project, and EWM was proud that the exhibition debuted in February at the Public Art Gallery (now sadly closed), in West Bromwich. As we left the exhibition, I could identify buildings that Fiona had snapped- sometimes, art and life are in perfect symmetry. Equality West Midlands has had an interesting and stimulating 2013, including meetings with sympathetic local politicians, participating in a nationwide photography project about income inequality and hosting a special event led by Richard Wilkinson, a co-author of The Spirit Level. 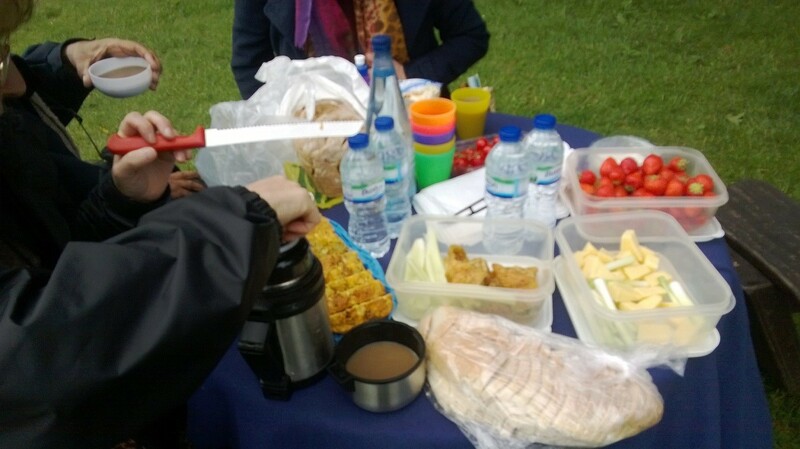 On Saturday 15th of June Equality West Midlands decided to host a social in Cannon Hill Park in the form of a picnic. We were relying on the British summer which is a risky strategy. We met for a mini committee meeting in the Mac where we discussed the exciting projects we are working on. By coincidence we were able to speak with Waseem Zaffer the Councillor for Handsworth and East Lozells who is also Chair of the Social Cohesion committee. We were happy to introduce him to who we are. 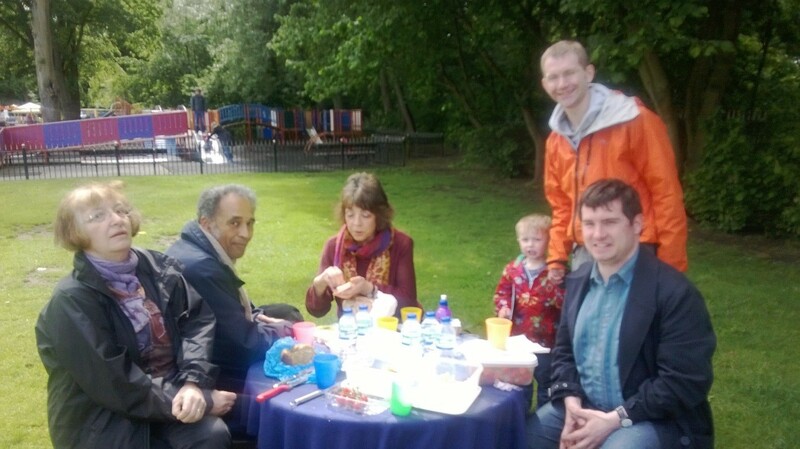 After the committee meeting we warily trudged outside bracing ourselves for the picnic. Fortune was on our side as the rain had subsided for the time being. We were also joined by the youngest member of Equality West Midlands as Chris who had brought his son Bryn. Unsurprisingly the slide is more exciting than income inequality so Bryn went off to play. We sat down to eat lunch. I had brought bread and hummus from my local vegetarian shop in Digbeth. The bread, whole meal with sultanas was made by Lucky 13 an Aston Based company. Gilly had brought delicious cheese from Worcestershire and Warwickshire cheeses and Vale of Evesham tomatoes from a local farm shop – Hillers on the Ragley Estate near Alcester. Barbara had very generously brought home made savoury feta cheese and carrot cake. Tom had obtained strawberries, samosas and other suitable picnic foods. All of the foods were sourced from shops local to us. Importantly the food was very tasty. We were able to enjoy a nice day out in a wonderful park. We are looking forward to the exciting projects we have to work on.